Pendleton- The Pendleton Round-up and Happy Canyon Hall of Fame is hosting the seventh annual Battle of the Bars competition in the Let’er Buck Room on Friday, March 3rd, 2017. The competition will begin at 6:00 pm and is open to the public with no cover charge to attend. Must be 21 years of age. Nine local bars are coming together in the Let’er Buck Room to compete for the “Best of West” title. Returning competitors will include last year’s champion, Crabby’s Underground Saloon, as well as, Sundown Bar and Grill, Vigil’s at Cimmiyotti’s, Hamley’s, Mac’s Bar & Grill, the Pendleton Coffee Bean and Bistro and Wildhorse Sports Bar. New to the competition this year will be Sister’s Cafe and Cadillac Jacks. Each establishment will create a signature drink that must contain Pendleton Whisky. Guests will be able to purchase a drink from whichever establishments they choose and cast their vote for their favorite. A tasting portion will also be offered for those that would like to try every drink before they vote. At the end of the event, votes will be tallied and the winning bar will receive a plaque along with bragging rights for the year. After the “Battle”, the Let’er Buck Room bar will stay open for refreshments until 11pm. The Pendleton Lion’s Club, which supports our community through many different service projects, including providing vision and hearing assistance for individuals in need, will be providing a variety of different dinner options. Dinner will be available for purchase throughout the event. 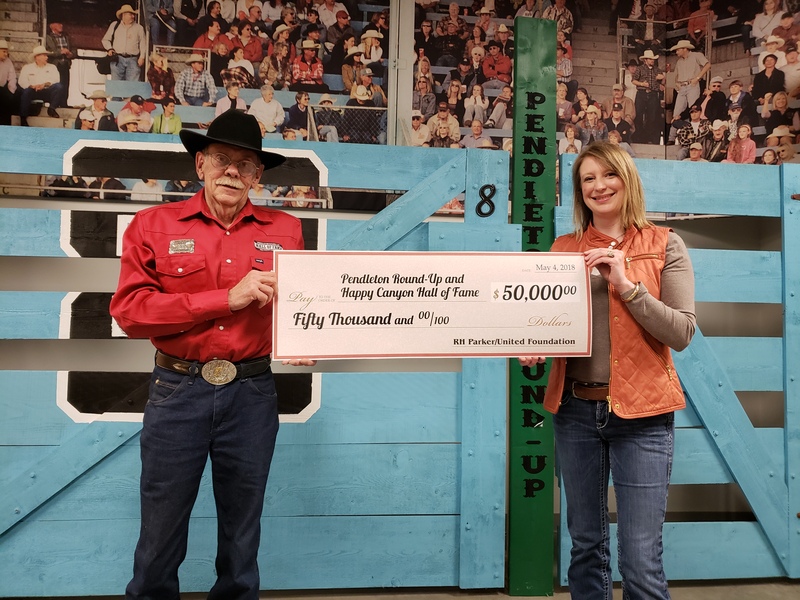 The Pendleton Round-Up and Happy Canyon Hall of Fame was founded in 1969. Exhibits range from a full-sized Teepee to delicate beadwork, the exhibits in the Hall of Fame cover a wide range of subjects and span the nearly 100 years of Round-Up history. Saddles, clothing, Indian costumes, photographs, firearms, trophies, wagons…hundreds of items are displayed for your enjoyment. You can become a member of the Hall of Fame and help to ensure the history and artifacts of the Round-Up and Happy Canyon we enjoy today will still be here tomorrow. For more information call 541-278-0815. The Hall of Fame building is located at 1114 SW Court across from the Round-up grounds. On May 4th, 2018, Cyndi Zamudio presented the Round-Up and Happy Canyon Hall of Fame with a $50,000 check from the RH Parker/United Finance Foundation for the purchase and implementation of interactive displays in the museum. The R.H. Parker/United Finance Foundation was established in 1994 by Richard H. Parker, Jr and family with the purpose of furthering education and youth programs in the Pacific Northwest. “The Hall of Fame is grateful for the generous contribution from the Parker Foundation which will enable our museum to add interactive touch screen history kiosks to our displays. These new pieces will provide an expanded experience for our museum visitors with video, text and photo components allowing visitors to dig deeper into the rich history of our events, competitors and volunteers. During the upcoming year we plan to build four interactive touch screen kiosks highlighting our famous bucking horse “War Paint,” “Competitors through the decades” “Round Up’s Hollywood/Stars Connection” and “Happy Canyon Regalia.” , said Patricia Dawson, Hall of Fame Exhibits Director. Cyndi Zamudio of the RH Parker Foundation & United Finance Presents Hall of Fame Director Norm Kessler with a $50,000 check.